Cretan Viper's-grass, a member of the Daisy family, is characterised by its thin, strap-like leaves. The yellow flowers of Cretan viper's-grass are sometimes reddish on the reverse side. This plant is related to the species Scorzonera hispanica (Salsify) which has edible roots. 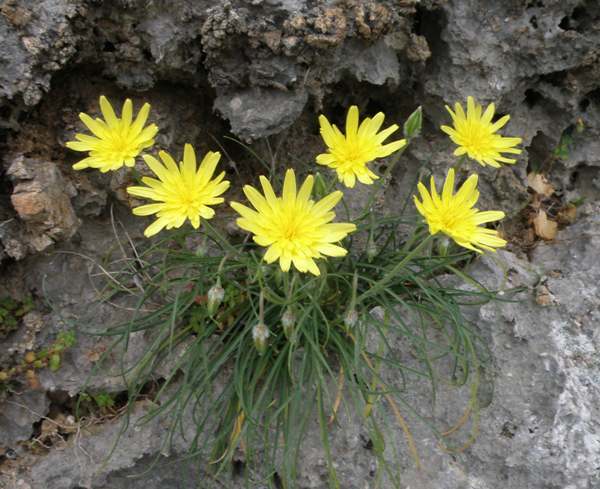 This plant grows on rocks, old stone walls and in other stony habitats. Cretan Viper's-grass produces flowers in April and May in Crete and the southern Agean islands. The plant shown on this page was photographed in Crete in early April.